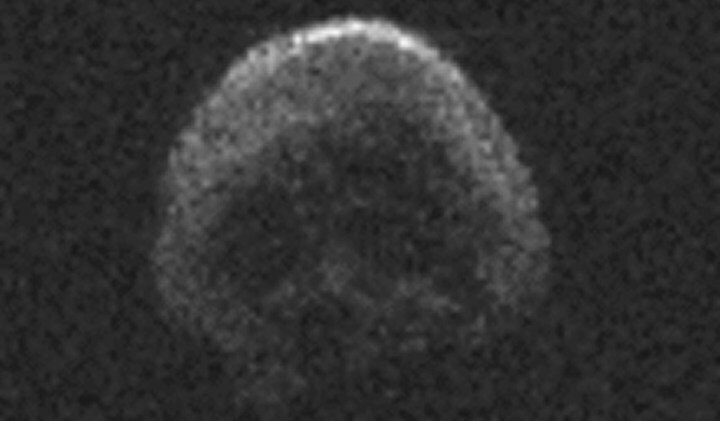 Raumfahrt+Astronomie-Blog von CENAP - Blog: Astronomie - Skull-shaped death comet asteroid will fly by Earth after Halloween The eerie space rock will zoom past Earth on Nov. 11. On Nov. 11, asteroid 2015 TB145 will zoom past Earth at a distance of 25 million miles. The first observed flyby of the ghoulish space rock occurred on Oct. 31, 2015. At that time, the space rock — NASA dubbed it the "Great Pumpkin" asteroid — flew past at a much closer distance of about 300,000 miles (see video below). The moon orbits Earth at an average distance of 239,000 miles. With a diameter of roughly 2,000 feet, the asteroid is too small and too far away to be seen with the naked eye. It was discovered on Oct. 10, 2015, by the Pan-STARRS1 telescope high atop the dormant Haleakala volcano on the Hawaiian island of Maui. If initial radar images of 2015 TB145 indicated that the space rock resembled a human skull, subsequent images showed it to be “much rougher” than originally thought, Vishnu Reddy, a professor of planetary sciences at the University of Arizona's Lunar and Planetary Lab, told NBC News MACH in an email. "I don't know why it's called a 'death comet,'" said Reddy, who has conducted research on the asteroid. "There is no scientific basis for such a term. Maybe it is related to the time of the flyby." The asteroid is thought to be an extinct comet — the rocky remains of a comet stripped of its icy bits by repeated close encounters with the sun. As comets draw near the sun on their elliptical orbital paths, the heat converts their ice into gas, which then trails out into space to create the characteristic tail. The asteroid is classified as potentially hazardous because of its size and proximity to Earth. But astronomers who have tracked its trajectory say there’s no chance it will collide with the planet. The next close approach won’t be until 2088, when the asteroid will come within 5.4 million miles of Earth. Astronomie - Skull-shaped 'death comet' asteroid will fly by Earth after Halloween The eerie space rock will zoom past Earth on Nov. 11.